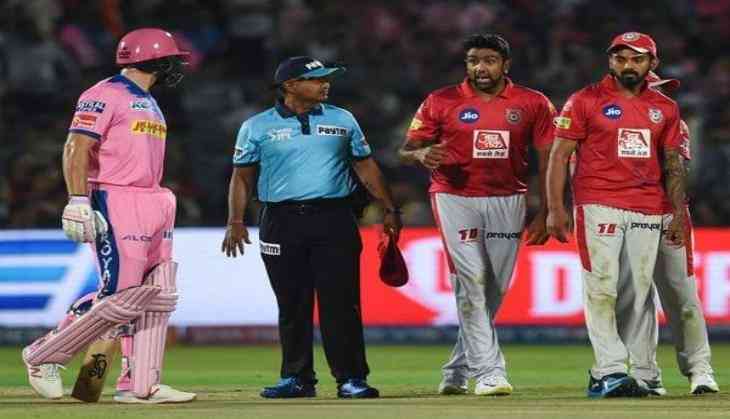 In a first in 12 editions of the IPL, Kings XI Punjab captain Ashwin ran out a rampaging Buttler, who was at the non-strikers' end, on his delivery stride in the 13th over, an action popularly known as 'Mankading'. TV replays showed that Ashwin had waited to let Buttler move out of the crease before removing the bails. While Ashwin was well within his rights as per ICC's rule 41.16, according to which even a warning to the batsman is not necessary, the incident has sparked a fresh debate on 'Spirit of Cricket'. "I think R Ashwin's action tonight speak for him and represent him when I looked up to the eyes of his teammates," a livid Upton said at the end of the match. Incidentally, Upton was the mental conditioning coach of the World Cup-winning 2011 side of which Ashwin was also a part. An angry Upton also had an animated interaction with Ashwin during the customary handshake at the end of the match. "I will leave it up to the IPL fans to decide whether that's the kind of thing they want to see and we will leave it up to the cricket world to judge R Ashwin's actions tonight. "For us, we were certainly there to play cricket, entertain the fans and be good role models for people who love the game," Upton said. The South African said he was proud that his players maintained composure and upheld the dignity of the great sport. "I thought players were really focussed and were able to reset themselves after that run-out. Losing four wickets in two overs was where the game slipped away. "I am very happy for the way the players reacted and responded to that situation, a conscious decision was to hold our heads high and maintain our dignity as a team," the South African said. When told that Ashwin was within his rights to run Buttler out as per laws of the game, Upton said that legality and spirit of the game are two separate issues for him. "I would still like to go and have a close look at the legality of it. But for us, the reality is Ashwin appealed and the umpire gave it out, we need to deal with it. "Legality is a separate issue and a lot of teams will like to have a close look at that issue. I would like to hope that the rest of the IPL continues in the spirit that we are all here for this beautiful game,” he signed off. Despite losing the match Upton drew some positives from the game. "Jos Buttler was amazing while he was batting and for a lot of the game we batted as we wanted and really set ourselves up for victory,"